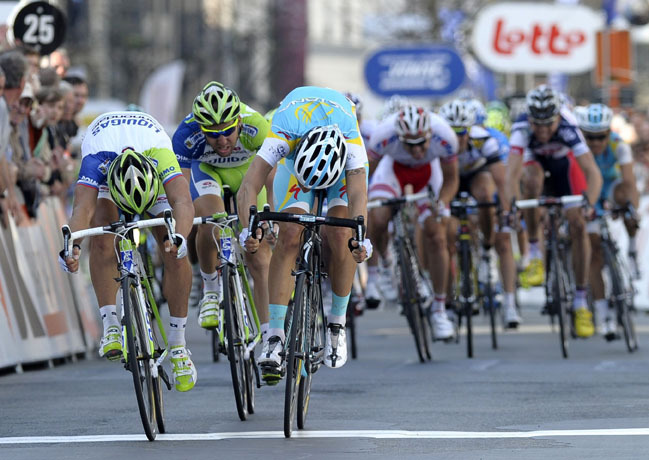 Peter Sagan won his first race in Belgium today in the Three Days of De Panne. The win came after an impressive show in E3 Harelbeke last Friday and second in Ghent-Wevelgem on Sunday. The bookmakers have Sagan at 11:1 for the Tour of Flanders, behind only Tom Boonen (OmegaPharma-Quick Step), Fabian Cancellara (RadioShack-Nissan) and Matti Breschel (Rabobank). When asked about racing De Panne, Liquigas’s director sportif Stefano Zanatta said it serves for experience and confidence. Boonen, Cancellara and Breschel are all skipping it, but they have far more experience of the Belgian road layout than Sagan. Sagan impressed immediately since turning professional at the start of 2010. Two wins in France in Paris-Nice and a stage in the Tour of Romandy. Last year, he won in Spain at the Vuelta a España, Poland, Sardinia, USA and again Switzerland. His Liquigas team-mate Daniel Oss played a big part in today’s win. He spent part of the day in the escape, attacking on the Berendries. After he was caught, he led the sprint out for Sagan. When he pulled off he forced Jacopo Guarnieri (Astana) to go about 50 metres too early. Sagan slid by, Guarnieri held on for second and another Liquigas rider, Fabio Sabatini placed third. Sagan has now won three races this season, with a stage each in the Tour of Oman and Italy’s Tirreno-Adriatico. He’d like to take one of the big ones, but remains modest about his ambitions. “I want to do well in Flanders and in Amstel,” he said, stopping short of saying he wants to win.